Happiness, everyone aspires for happiness. Nobody aspires for distress, but distress is forcibly come upon you. Similarly, the sastra says, "As distress comes without any desire, similarly, happiness also will come without any endeavor." 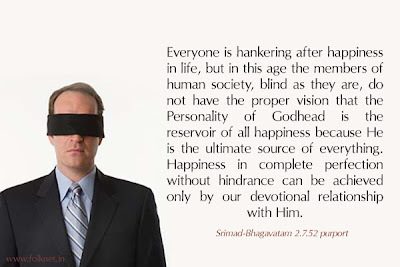 So long we are in the material world, the so-called happiness and distress will come and go, but our, the human life, the endeavor should be how to find out or revive our relationship with God. That is our main business. They are just like seasonal changes, happiness and distress. Matra-sparsas tu kaunteya sitosna-sukha-duhkha-dah. Just like there is winter season. It is pinching cold. That will also not stay. And the scorching heat, that will also not stay. It comes and goes. Therefore, so long in the material world we are, the so-called happiness and distress will come and go. Don't bother about it. You simply try for reviving your Krsna consciousness, or God consciousness.